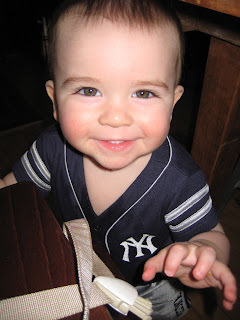 In the summer of 2005, I went to see the New York Yankees play ball over 50 times. At the time, my job at In Style was all consuming—twelve to fifteen hour days were the norm. But on those magical days, all bets were off. I'd throw on my team shirt, grab my puffy hand, and yell "Game Night!" as I ran to the elevator to catch the subway up to the Bronx, just barely making it to the Stadium in time for the 7:05 start. Getting up for work the next morning was always brutal. These days, brutal doesn't even begin to describe the mornings or the hectic pace of our day-to-day lives. More often than not, I'm startled awake by a little man in the next room calling for mom (and milk)—usually between 4 and 5. Then, it's rush rush rush to get everyone showered, dressed and out the door. The end of the day is much of the same. Rush rush rush to pick up Hudson from school, drive home, make a fire, fix dinner and sit down as a family to eat. We might find a minute or two to squeeze in some train time before bath and by 8, well, it's bed time for Woozy. Then its rush, rush, rush to do chores and put away all of Huddy's toys. Maybe even do some laundry. And in between all of the rushing is a full day of work. Now where's the magic in that? Tonight was a little different. Tonight, we skipped the chores and sat down to watch a movie: Moneyball. If you haven't seen the movie, you should. It's awesome. When it ended, I was sitting at the edge of my seat thinking, OK, so maybe there's still a little magic left out there after all. A lot of people say they don't like baseball because it's just too slow. Too slow? That's the best part! (Well, that and the stats. I love stats!) But seriously, though. Where else but at a baseball game can you detach from the rest of the world for at least 3 hours, all the while, getting the opportunity to be a part of history? After all, every inning in every game is its own chapter in the season's book. And regardless of where your team ends up in October, every April brings new hope. On April 4, 2010, I went into labor. It was opening day. On the 7th, Hudson was born (I know, RIGHT??) and the Yanks beat the Red Sox 3-1 at Fenway. Meanwhile, on that same day back in New York, the old stadium was coming down. Specifically, the section between home plate and third. The very same section where my seats had been that glorious summer so long ago. It's true what they say: It's hard not to be romantic about baseball. Sometimes I wish it was like the old days, with the freedom to come and go as I pleased. But more than that, I look forward to passing on my love for the sport and taking Hudson to his very first game.